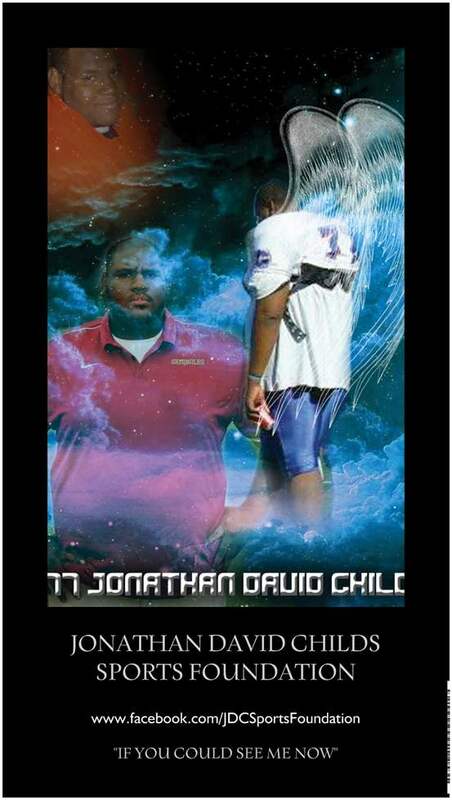 The Jonathan David Childs Sports Foundation was established in May, 2011 by Celestial Enterprises Unlimited, Inc., a faith-based 501 (c ) (3) non-profit organization to honor the memory of Coach Jonathan D. Childs who coached and mentored football athletes at Salem High School in Conyers, GA. Coach Childs played football for Georgia State University’s first football team. 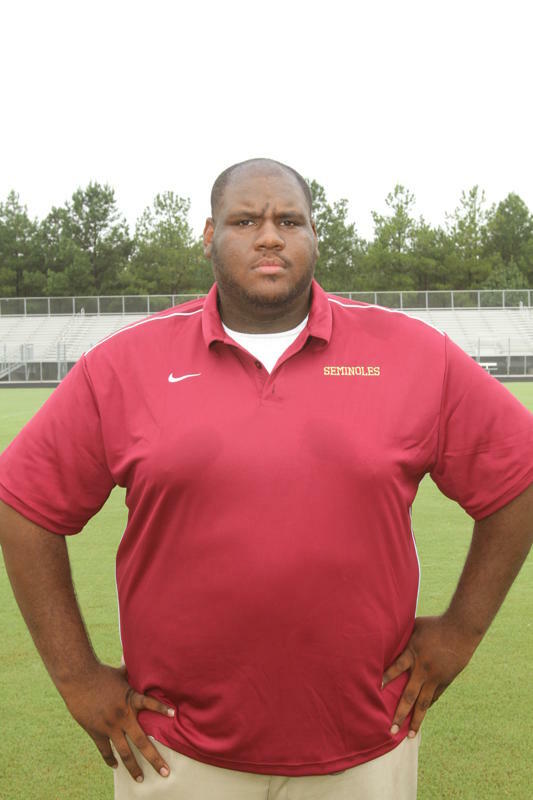 Though he was only 27 years old at the time of his passing, Coach Childs possessed a tremendous knowledge of football and the ability to transfer some of that knowledge to his players. He also was able to motivate, inspire and empower the teams he trained with his patient, caring, but firm coaching style. 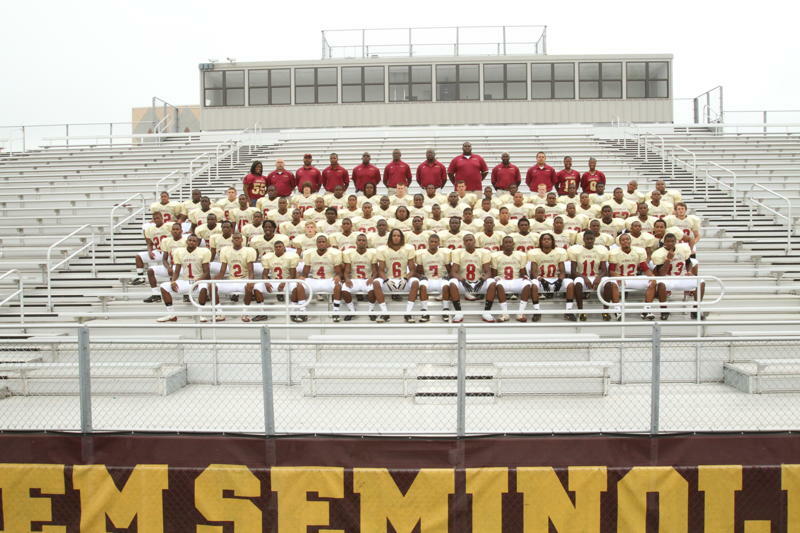 Coach Childs was committed to helping instill positive character traits and good sportsmanship in his players. The Foundation’s mission is to provide scholarships for high school seniors in order to support their academic, athletic and personal growth, and to promote character-building programs. Therapeutic sports activities such as football /basketball camps, athletic competition, youth mentoring/coaching service opportunities and sports character-building programs with an emphasis on developing good sportsmanship are part of the fabric of the Foundation's goals and mission. Applicants will be awarded the scholarship (s) along with a plaque during an annual football banquet or during the Salem High School Annual Awards Program. All donations are tax deductible and can be made securely below through PayPal. Donations may also be made by check or money order and made payable to: Celestial Enterprises Unlimited Inc./Memo line JDC Sports Foundation. The Jonathan David Childs Sports Foundation thanks you in advance for your donation, support, prayers, and helping us to keep Jonathan's vision and legacy alive! In this book, the author shares her personal experiences with death and the heartache of losing her 27 year-old son suddenly, without any warning, one morning as he peacefully slept. She courageously lets the reader journey with her as she walks through the valley of grief and follows the winding road to recovery. The author offers hope to fellow travelers and emphasizes the importance of allowing grief to take its natural course, so healing can occur. All proceeds from the sale of the book will be donated to the JDC Sports Foundation. The Jonathan David Childs Sports Foundation would like to take this opportunity to share with you two special events that have taken place in the month of May. Both paid tribute to Jonathan’s memory and his dedication to empower, mentor, and train youth to be the best that they can be on and off of the football field. 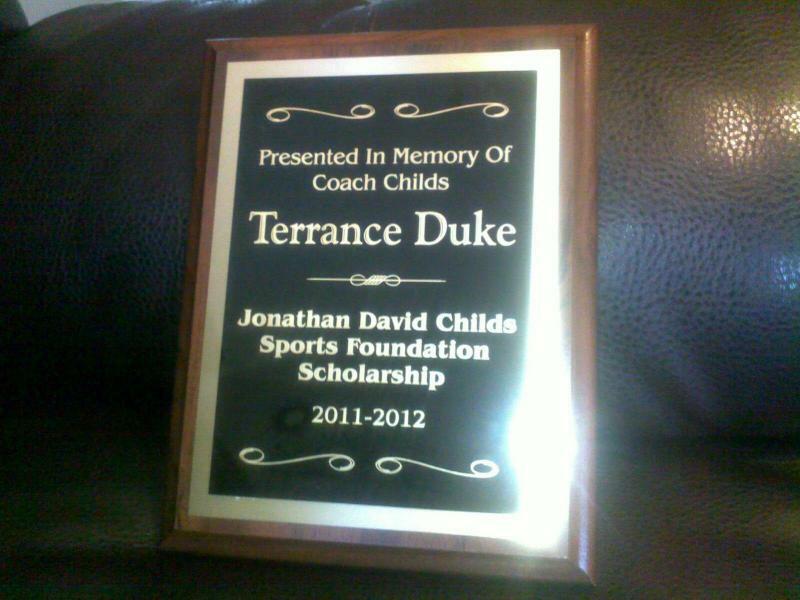 Your charitable giving has allowed us to award the First Annual Jonathan David Childs Sports Foundation Scholarship for $500.00 in memory of Coach Childs to Terrance Duke, a graduating senior and football athlete from Salem High School in Conyers, GA. Terrance met all of the guidelines to receive the scholarship and has played football for 11 years. He has been admitted to Reinhardt University in Waleska, GA for the fall of 2012. 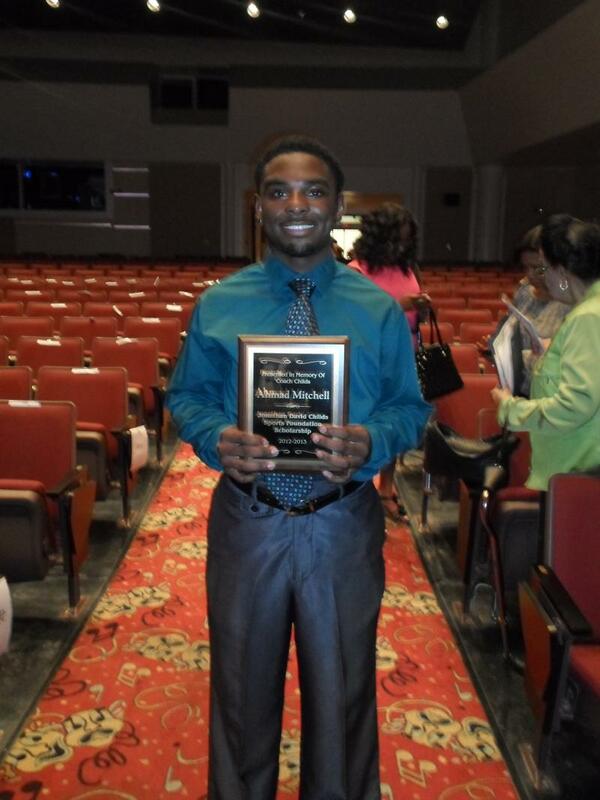 Terrance received a plaque (Below) at Awards Night Ceremony at Salem High School on May 10, 2012. 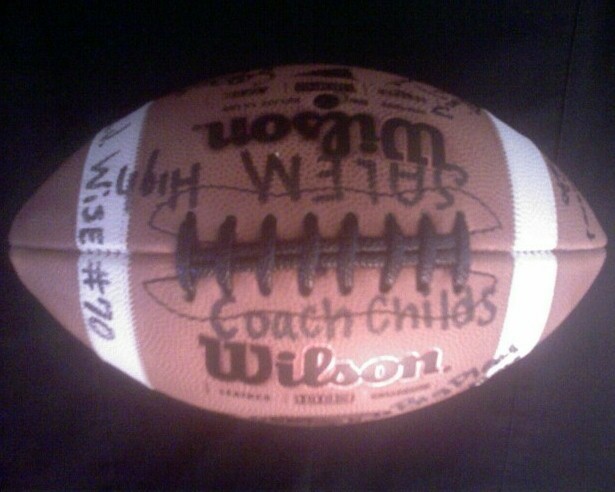 It was presented by Coach Childs’ brother, D. Christopher Lake. We are sure Coach Childs’ spirit was somewhere nearby proudly smiling and cheering Terrance on! The Foundation asks you to continue making donations so we can continue to award this $500.00 scholarship in Jonathan’s honor on a yearly basis. Donations may be made via PayPal at: www.celestialenterprisesunlimitedinc.com on the Jonathan David Child Sports Foundation Page. No amount is too large or too small! We would like to take this opportunity to thank Ms. Iesha T. Edwards, College and Career Coordinator at Salem High School, for her guidance and support during the application and selection process. Above: Terrance Duke, Mariah Childs, Iesha Edwards at Salem High School, Conyers, GA.
We at the Foundation, would like to congratulate Terrance Duke for being the first recipient of the Jonathan David Childs Sports Foundation Scholarship and pray that he will use it wisely to assist him as he matriculates on to college. Above: Mariah Childs, Chair of the JDC Sports Foundation Scholarship, awarded Terrance the check for $500.00 at Salem High School, Conyers, GA May 16, 2012. We thank all of you for helping us keep Jonathan’s vision and legacy alive! For your convenience donations can be easily made (Above on This Page) under DONATIONS. Donations made by check can be mailed to: JDC Sports Foundation, 3839 Walnut Path, Lithonia, GA 30038. 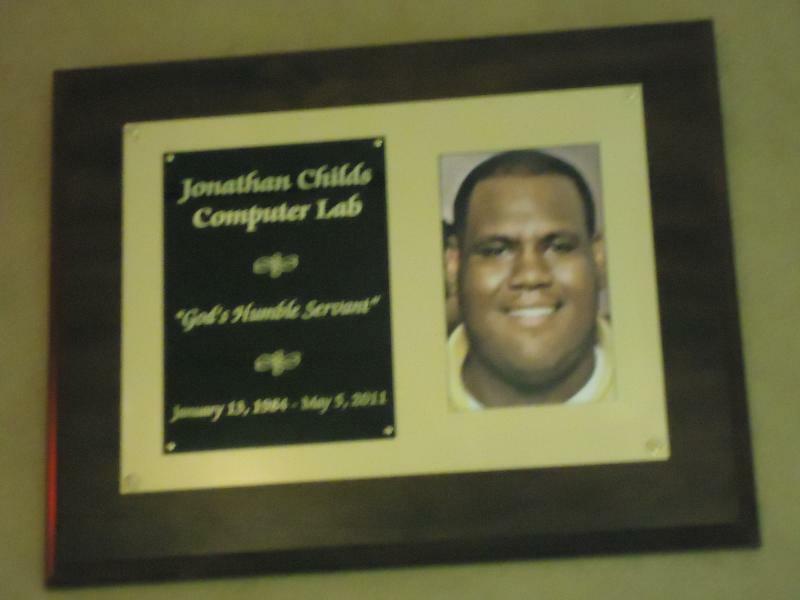 The Jonathan David Childs Sports Foundation is also pleased to report that on May 17, 2012, The Potter's House Family and Children Treatment Center in Stone Mountain, GA dedicated its Computer Lab in honor of Jonathan’s dedication to the Potter’s House, the consumers and families he served during his employment at the Center. The event was attended by a former youth Jonathan mentored who read a poem he dedicated to Jonathan, as well as staff, Jonathan’s family and friends. 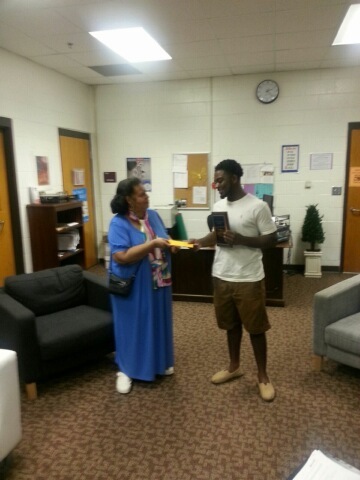 Jonathan's mother, Mariah Childs, signed her latest book, WALKING THROUGH the VALLEY, which she wrote to empower grievers by sharing her “grief walk” and her “survival kit” for the Potter's House staff. The book may be purchased via PayPal (above) on this page under DONATIONS. All proceeds from the book sales will be donated to the JDC Sports Foundation. 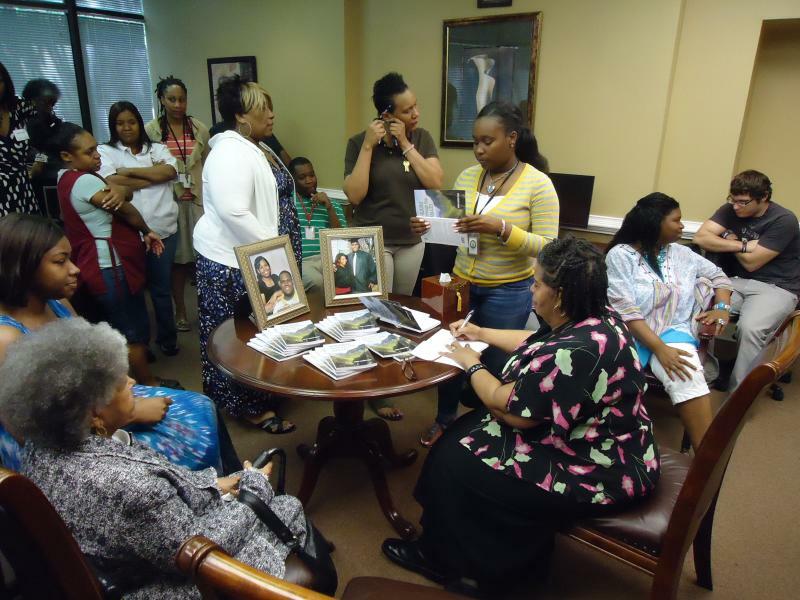 Mariah Childs (Above right) signing copies of WALKING THROUGH the VALLEY for staff during the Dedication of the Jonathan Childs Computer Lab at the Potter's House in Stone Mountain, GA. The Jonathan David Childs Sports Foundation uses a portion of the donated funds to sponsor the JC Bears Teddy Bear Campaign. The purpose of the campaign is to raise funds so that the teddy bears can be donated to identified children throughout the local community. Some may be sick, neglected, abused or just in need of a cuddly "friend" to comfort them. 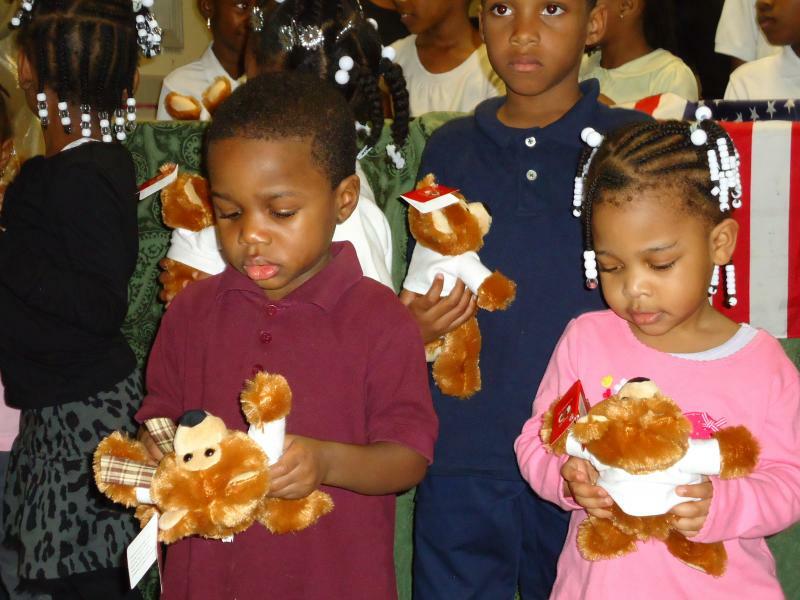 The JC Teddy Bears are given during the Christmas holiday season in memory of Jonathan, who was like a "big teddy bear" to the pre-school aged and young children he worked with at The Children’s School in Atlanta, GA, as well as his nieces and nephew. The teddy bears have a football t-shirt on with JC BEARS Football Team and a football printed on them. 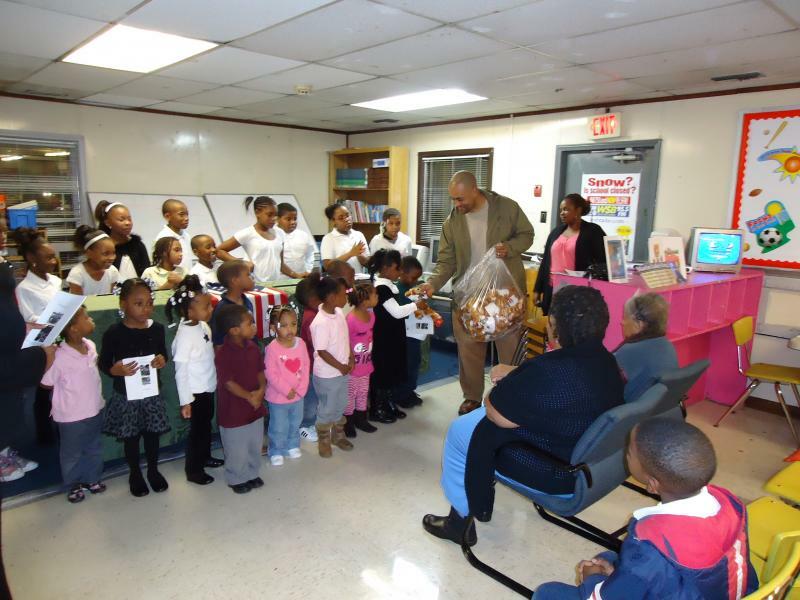 This year, the Teddy Bears were donated to pre-school age children during a Tribute Ceremony honoring Rev. 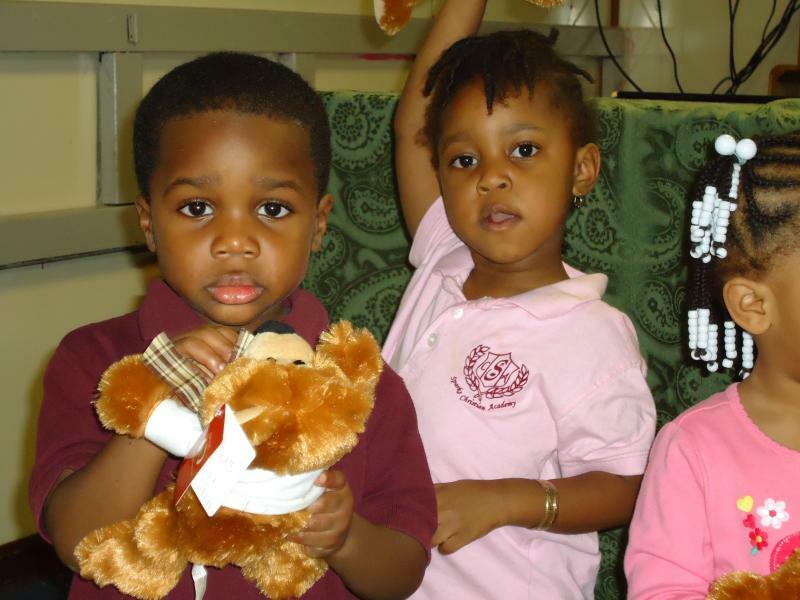 Martin Luther King, Sr. for Jonathan, TWO GIANTS AMONG MEN at Sparks' Academy in Lithonia, GA.
Children (Below) received JDC Teddy Bears during a Tribute to Jonathan on 1-12-12 at Sparks Academy in Lithonia, GA. Above: Teddy Bears being distributed by D. Christopher Lake, Jonathan's brother, as Mariah Childs, Jonathan's mother, Georgia Landrum,﻿﻿﻿﻿﻿ Jonathan's grandmother, and Manny Lake, Jonathan's nephew look on. 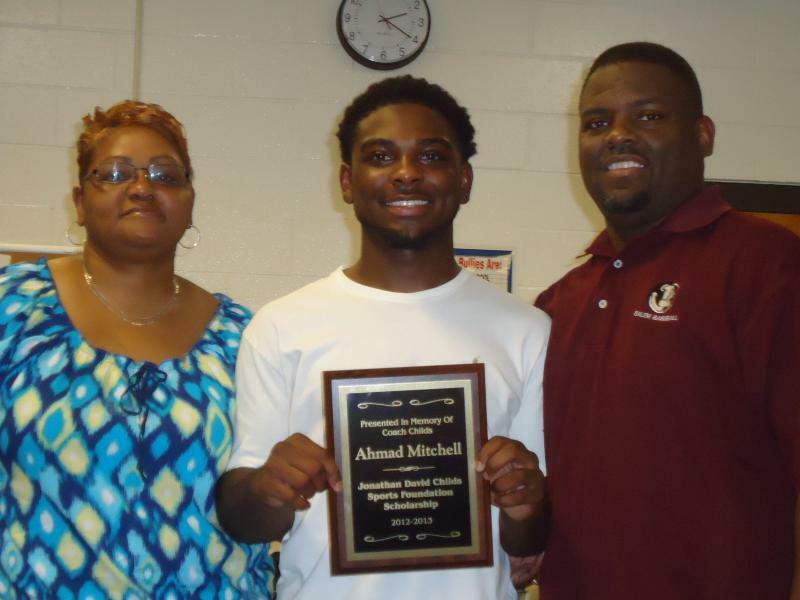 Above, Ahmad Mitchell at Salem High School Awards Night with the 2013 JDC SPORTS FOUNDATION PLAQUE. at Memorial Middle School. Mentoring was a passion of Coach Childs, too. proud parents, Mr. & Mrs. Mitchell. 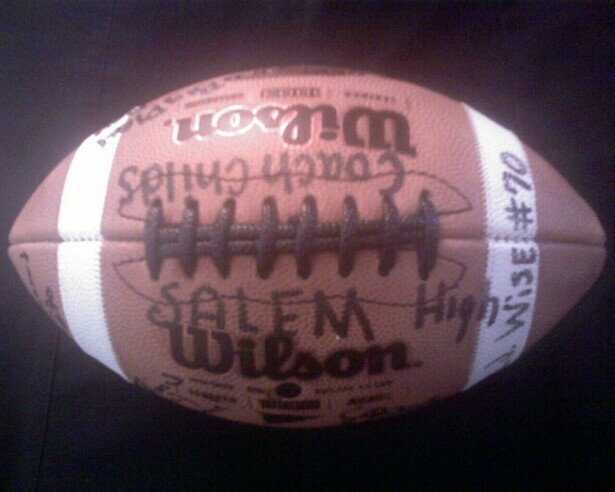 of $500.00 at Salem High School in Conyers, GA. 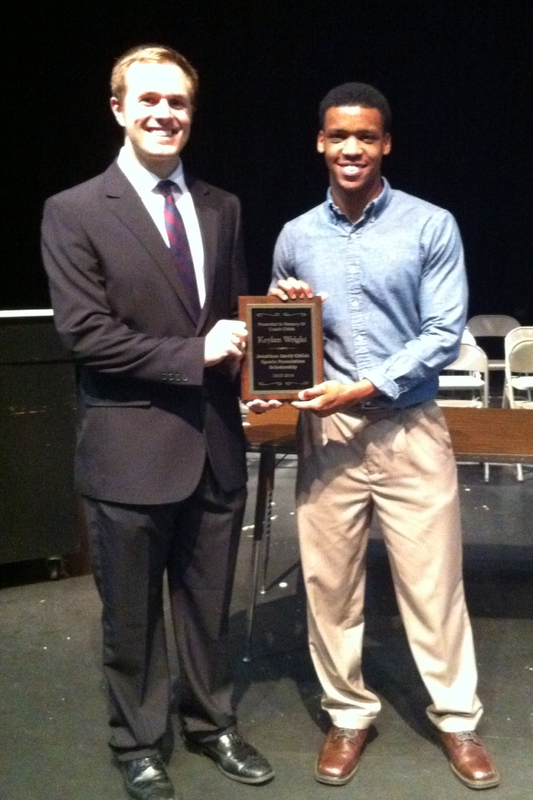 The 2014 recepient of the 2014 Jonathan David Childs Sports Foundation Scholarship is Keylan Wright receiving the Plaque from Salem High School Counselor, Chris Farr at the 2014 Salem High School Awards Night in Conyers, GA.
Keylan Wright along with his parents pictured below holding the $500.00 JDC Scholarship Check he received from Mariah Childs, Scholarship Committee Chairman. 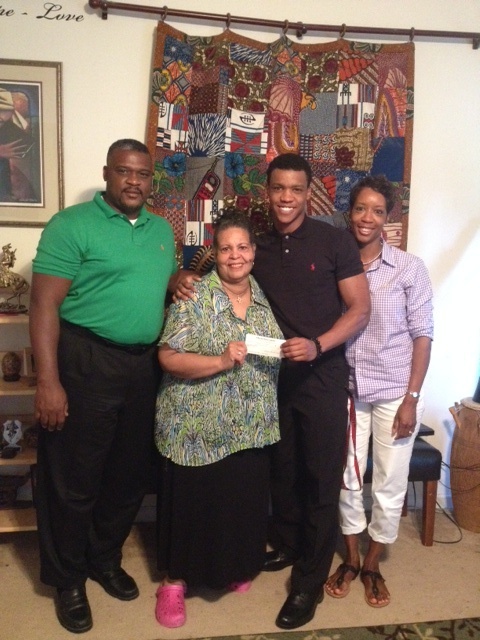 Above Keylan Wright receiving the JDC Scholarship check from Mariah Childs. 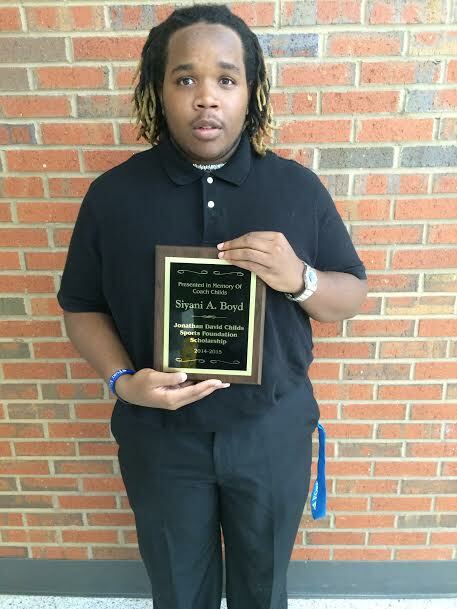 The Jonathan David Childs Sports Foundation Scholrship for 2015 has been awarded to Siyani A. Boyd, Salem High School Senior athlete presented with his Plaque during the Salem High School's Awards Ceremony in Conyers, GA on May 7, 2015 where Jonathan last coached football. Siyani A. Boyd is pictured below. Above Siyani A. Boyd is pictured with Salem High School College Counselor/Football Coach, John Starr II. 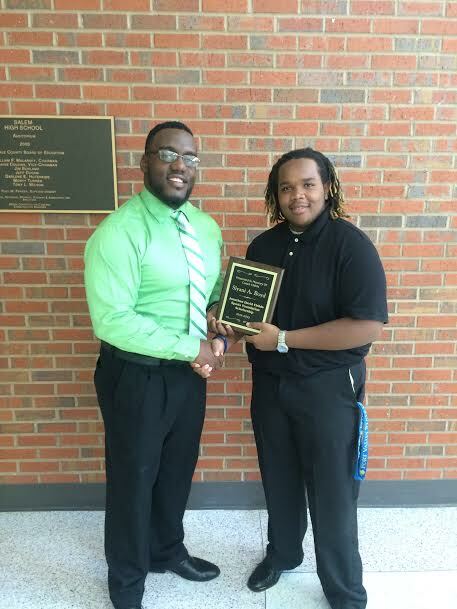 The Jonathan David Childs Sports Foundation Scholrship for 2016 has been awarded to Zaiyid Cooper, Salem High School Senior athlete presented with his Plaque during the Salem High School's Awards Ceremony in Conyers, GA on May 7, 2016 where Jonathan last coached football. 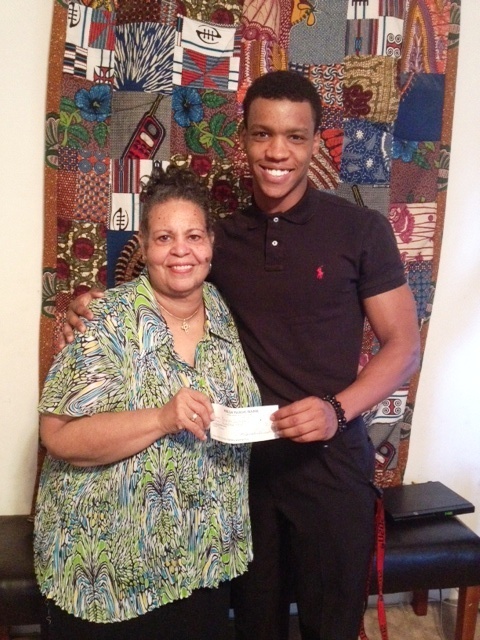 ﻿Above, A proud Zaiyid Cooper is holding the 2016 JDC Scholarship Check awarded to him. The Jonathan David Childs Sports Foundation Scholarship Committee is currently inviting qualified Salem High School Senior football athletes to apply for the Fifth Annual $500.00 JDC Sports Foundation Scholarship to be awarded in the Spring of 2017 to a qualified applicant. The scholarship is awarded in the memory of former Salem High Football Coach, Jonathan Childs. (Contact the Salem High School College Counseling Office in the Fall of 2016 for further information). Applicants must have a minimum of a 2.5 GPA, demonstrate good character and sportsmanship on and off the field, perform community service, show evidence of need, be accepted, and have signed a letter of intent to attend a college for the fall of 2017, and have 2 letters of reference. clestialenterprisesunlimitedinc.com/jonathan_david_chiSPORTS FOUNDATION Page via PayPal. Mail to: 3839 Walnut Path, Lithonia, GA 30038. THANK YOU FOR YOUR CONTINUED FINANCIAL DONATIONS AND PRAYERS! YouTube Link: Jonathan David Childs "INDELIBLE HANDPRINTS"